As promised, here are instructions for the Balloon Banner we made for June’s 1st birthday celebration. I hope you find the perfect excuse to make one too! 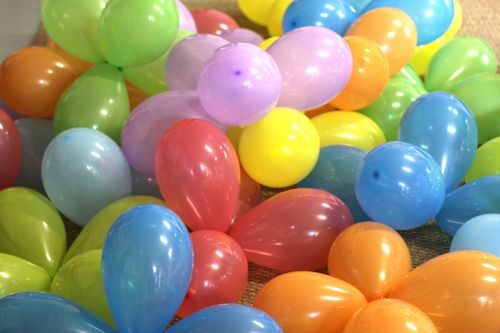 1) Start by grouping balloons in to groups of 4. We used rainbow colors, but using all the same color, or lots of different shades of blue would be neat too. 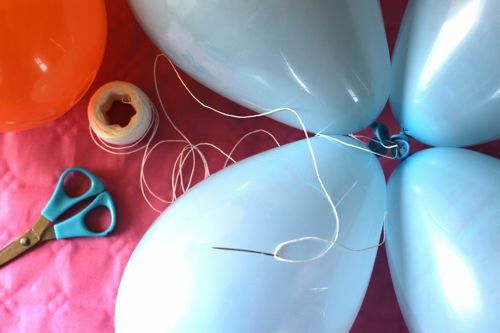 2) Blow up each set of 4 balloons and tie the ends. (I’m awful at tying balloons! But Maude is really good, so she was a big help.) No need for helium, your own lungs should do the trick. Do your best to get the balloons fairly equal in size. 3) Thread some good twine (I used a waxed kitchen twine) on a big needle — upholstery size is perfect. Technically, a small needle would work too, you just need the eye to be big enough to pass the twine through. 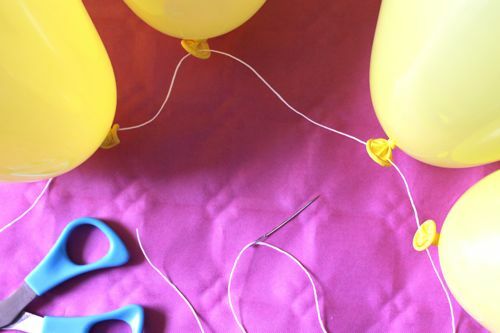 5) Slide the balloons to the end of the string and trim off threaded needle and remaining length (you’ll use them to thread the next set of balloons). Leave a 2 or 3 inch tail on either side of the 4 threaded balloons. 6) Cinch the four balloons together and use a square knot (right over left, left over right) to keep them nice and tight. 7) Do the same thing for all your sets of 4. For our banner, we made 18 sets of 4. Three sets of 6 colors. 8) When you have all your sets made, thread the needle again, but don’t trim the thread from the spool. 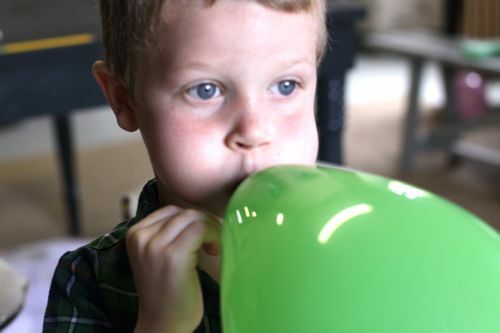 9) Pass the needle through the center of a balloon set. Use the point to go through at least of couple of the balloon ends so that the set is secure on the twine. 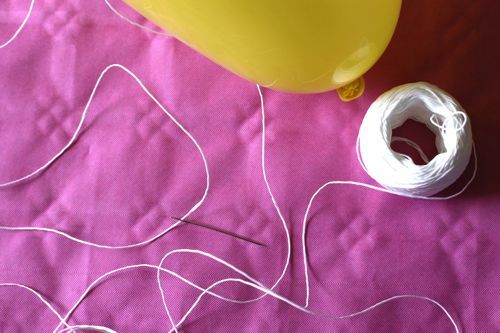 10) Use the needle to add another balloon set, push each set along the twine at intervals of 5 or 6 inches. If you’re going for the same rainbow look we used, you’ll thread all the red sets first, then all the orange sets, then all the yellow sets, etc. 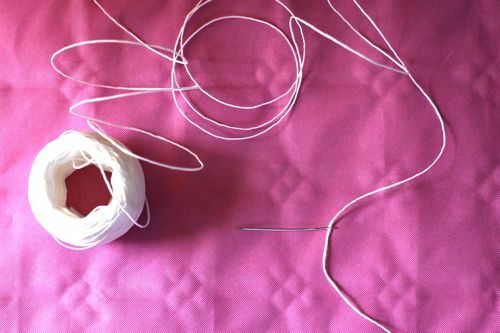 11) Keep adding sets with the needle and sliding them along the twine till you’ve completed your banner. 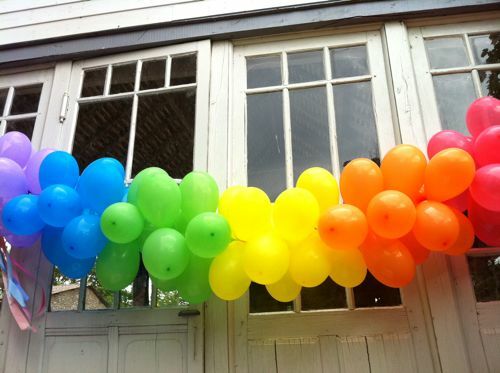 Leave a long tail of twine on either side of the balloons so that you can tie the banner to a wall or arch or window. Then cut the twine from the spool. The balloon banner is so light that it’s easy to hang. We used push pins in the wall and then wrapped the twine around the push pins. That’s it! Your DIY balloon banner is done! Now you can find the perfect place to hang your banner. Yay! My inspiration for this balloon banner project was something I saw in Amsterdam. We arrived in the city the day after Queen’s Day and lots of festive decorations were still up. The orange crepe paper fringe is so cute! It would make a fun replacement for the ribbons we used on our banner. I’m thinking of an excuse to make this . . . . . . so darling! I have ALWAYS wanted to know how to make one of these! The very last picture made me smile. So lovely! We just had a birthday here on Sunday – wish I would have made this beautiful banner! How fun, Kim! You can make it using your school colors. Super easy! Something you could do while watching a movie — especially if you have some room to spread out. I’m gonna make one for my Ximena’s birthday! But if my other 2 girls like it ( that I’m sure they will) I’ll be doing this 2 more times. They love rainbows and this is just perfect, thanks for sharing Gabrielle! Oh, I wish I had this two weeks ago for Teacher Appreciation Week. We did a theme of “You are our gold at the end of the rainbow” So everyday we did something with a rainbow and gold theme. Love it – thank you! This is what I will be doing next weekend! Wow wow wow! Can’t wait to make this!!! Any occasion is a good one for balloon banners! It’s true. Balloons are always a hit! And they’re such a bargain too. Love this idea! It turned out so fun and festive! Every time I look at this I have a sudden craving for green grapes – those green balloons look just like green grapes to me. :) Ha! What a gorgeous idea, and with a 2nd birthday coming up next week I have the perfect excuse! Did you make it on the day? Good question! Yes. I made it the day of. And kept it hanging the day after to see what happened. It was completely deflated by the afternoon of the following day. I’m tring it out Saturday – glad you answered this question! Best of luck, Ashlynn! I’m sure it will be gorgeous and cheerful. I made one last year for my twins birthday in september and it has been on until Christmas!!! I’m throwing a Canada Day party. I think this garland made with red and white balloons would be a perfect decoration. We did something like this decorating for numerous dances when I was (much) younger. There is another way to do it for those interested. We used a paper clip to group the balloons, then strung them together through the center. I’m sure that was safer than giving a bunch of teenagers needles! Also, if you do use helium, it floats like a rainbow and you can secure the ends by tying them to something or with big bolts from the garage! 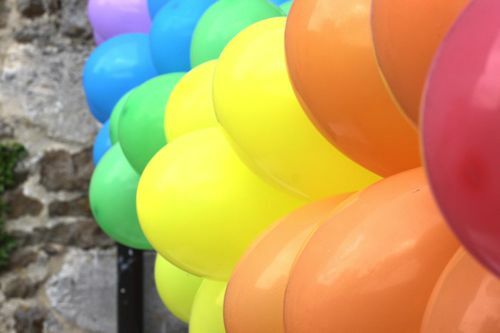 I recently made a rainbow balloon garland for my twins’ 5th birthday party…Balloonapalooza! I was fortunate to come across some awesome tape that has holes in it. 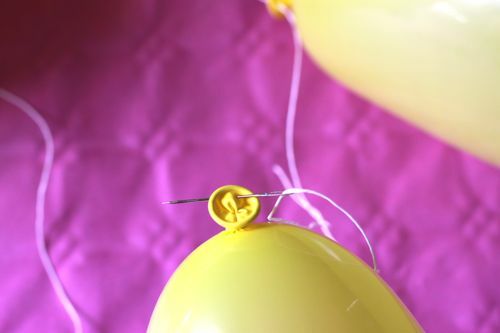 The knot of the balloon is pushed through the holes – so easy and I think I can reuse the tape. We also used balloon pumps to inflate the balloons and made the garland the night before. I bought the balloon tape here at Party City but the only link I could find was this..
Hope that makes life simpler for everyone! You made yours the night before I was wondering what time your party was the next day. Im worried about making it the night before with her party at 1 the following day. Thanks! Yes I was wondering if I make the night before will it withstand for the party at 3pm? oh how great! we made snowballs from bunches of white balloons for our girls’ birthdays in december, and it was quite a wrestling match to gather them together – the needle + twine is a great idea! Here’s the link to my photos- nowhere as nice as yours, inside at night ! I bought yellow smiley balloons by mistake but it works. WOW! It turned out perfect! How fun! That is wonderful and cute! I will try to make one for my daughter’s first birthday. I have to share this with my facebook fans. Love this! Thanks for sharing. I’m thinking this would also be perfect as a red, white, and blue balloon bunting for 4th of July! I love the idea! cheap and easy to do. 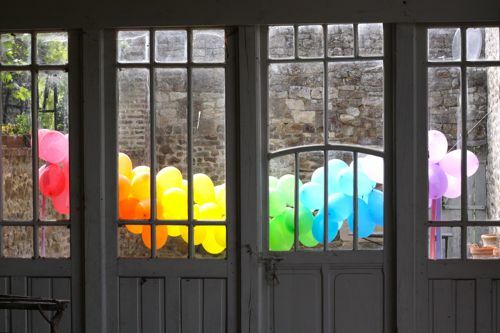 balloon arches were all the rage when I was having my bat mitzvah…and now the secret is out for how to make our own! so cool! my son, eddie, loves loves LOVES balloons! when he is feeling a little grumpy we just go to the dollar store and buy him a balloon and he watches it and tries to get it for hours. he’s turning one this july and our theme for his party is “red balloons” so this will be perfect! thanks so much for the tutorial!! What a handy tutorial! I’ve always loved the way balloon banners look and figured they couldn’t be too hard to make, but had no idea how. Thanks so much for posting. It’s also really cool to know that you can do it without helium! Love this. So colorful and catchy, yet thrifty. Thanks for sharing! Thanks for the timely post! Perfect! I’ve been planning on making this for our high school reunion’s family picnic (10 years, so lots of darling teeny alumni offspring to enjoy balloons) and now I know HOW! Thanks Design Mom (and offspring). Love this! I am going to try it for my youngest’s second birthday in August. You are lucky you had some extra hands to help you! :) Beautiful!! My kids are so helpful! It’s fun to be able to work on projects with them, now that they’re older. fab idea! I already spotted it on pinterest! ;) Oh and she is too precious! I love first birthday’s! fabulous! so colorful, so pretty! love it! Perfect timing, my little (big!) 3 year old boy requested a “hockey-rainbow party” that is occuring this Saturday. I figured that it was such a creative request, I had to try. Off to buy balloons! PS You are all so cute clapping for Baby June. Love this balloon banner. I’m planning a rainbow party for my three-year-old, so this is perfect! I’m a graphic designer mum too – only two kids though. I live in Australia and am starting my own DIY party printables company after I became completely obsessed with cakes & cupcakes about a year ago. So nice to find you here! I eagerly look forward to more posts. Awesome! And so simple. Who knew? My daughter is graduating next week…I think her school colors would be so festive!! Thank-you! I didn’t have balloons at my little girl’s first birthday for fear one of the kids might burst them (by accident or otherwise!) and totally freak her out. This has such great impact (and can potentially be placed waaay out of reach) that I’ve decided: Balloon Garland For Birthday Number Two-oo!!!!!!!!!!!!!!! For a 14 month old, she has impeccable taste – no, seriously! – as indeed do you, so she’s bound to love it. Thanks Gabrielle!!! I love it!!!!!!! I especially love the photo of the fam cheering June on. Thank you Gabby I love the last pic the best. What a little treasure. My lungs will need a bit of training, but with such a gorgeous impact my daughters 3rd birthday will be all the more colourful. Thank you for the easy to follow tutorial! I’m bookmarking this to use in January for my little Megan’s first birthday! Will have to attempt this…so beautiful! Love the picture of the family clapping! It’s a fun picture! I’m so glad we captured it. balloons make everyone happy! thanks for the tutorial..
oh wow definitely will do this for my girls birthday on the 1st of June! Oh excited!! I love this! So fun – and affordable, to boot. I’m definitely bookmarking this for a big family birthday in the fall. Thanks so much for sharing! I am thinking a book is next. Slideshows are such a good idea, Alli! Perfect for my n°2 first birthday! Thank you so very much! You’re so smart. :) I’ve strung up a few balloons before, but I never thought to thread the string THROUGH the knot end of the balloon! Thanks for the instructions! We’ll be making this for my son’s first birthday party this weekend! My 7 year old came up behind me as I was reading this and said, “How do you make THAT! !” So, thanks for the tutorial -we will definitely need to put one together soon! This is fantastic! I’ve been obsessed with banners lately — I just made some tiny bunting as a cake topper for a graduation party last weekend (http://goo.gl/tPTBm), but I think this supersized balloon version would be perfect for my nephew’s birthday next week. Thanks for the how-to! Yay! Thanks so much for the instructions. My daughter turns ONE on Wednesday and this will be perfect to celebrate her!!! I always wondered how these were made. They look awesome!! Thank you so much for the tutorial! LOVE IT! She’s adorable and the balloons are so fun. I am going to make it for a 1 year old photo shoot on Wednesday. How far in advance do you think I could make it and it would last? If I make it tomorrow night do you think it will still be good by Wednesday afternoon? I think I might need to make this, just cause. It’s that awesome. Love it, love it! :D Thanks for sharing. I just might make one or more of those, LOL. Now I know how to actually make them nicely. My son’s 2nd birthday party is next weekend and I have been looking for something like this…I can’t wait to try it! I will be co-chair of the 5th grade moving up ceremony next year at my childrens elementary school. I’m copying the directions and putting them in our folder for next year!! Decorations are always the hardest ideas to come up with!!! Love the rainbow. 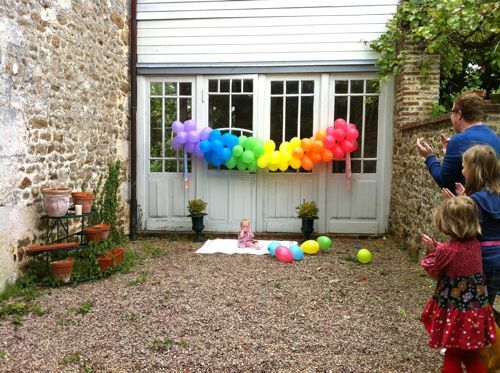 On a different note a friend of mines kids made a balloon rainbow for her when she returned from the hospital. 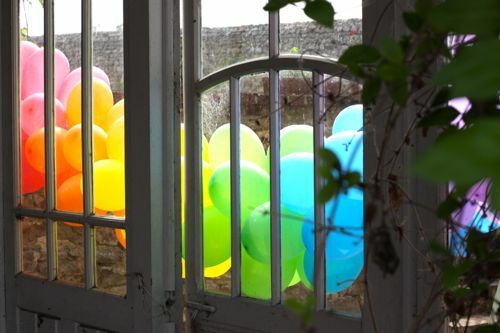 and then saved the broken baloons and put them by color in a arched shaped glass to save . I was so happy to see this post, b/c it was just what I was looking for for my daughter’s first birthday party decor (except better!). I followed this guide pretty close except, I made the balloons in sets of 3s instead of 4s, and it was still lovely. 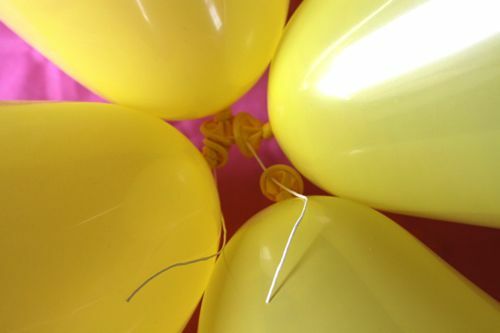 But as a note to all of “y’all” who live in the South of the U.S. like me– balloons and 85 degree weather do not mix. I tried hanging my banner up prior to her 5:00 party (at 3 p.m., which is the hottest part of the day in these parts), just to check one more thing off my to do list, and very quickly the balloons started popping. (Kind of a dunce move on my part.) So I moved the banner inside until 5 and it was fine. But if you’re expecting really warm weather this might work best indoors. Oh wow! Just love this balloon banner – I was at a birthday party last week where another clever mama had done this – it really made such a difference to the decor. I’ll definitely give this a try. Plan to make it this weekend for my son’s 5th birthday. I’m going to do red, white and blue for 4th of July! Thanks for the info! 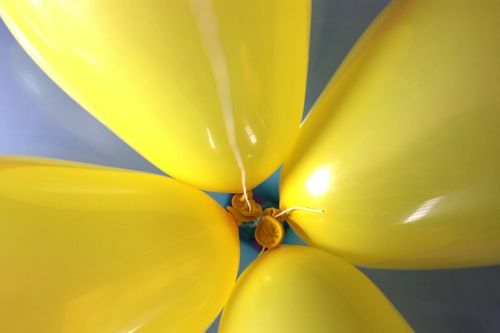 I worked at a a party store, it may be simpler to tie the ends of two balloons together (make two sets). When you have both, set them up to look like an X like in the picture of the 4 yellow balloons being tied together with string. 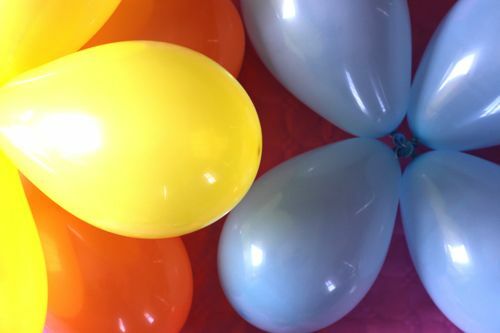 Laying one set over the other (by the tied together ends), spin two balloons (from different sets) over one another to attach them together, and then do the same to the other balloons. This will hold them together, especially if the balloons are blow up big enough they will push together and hold each other. Thank you so much for this beautiful tutorial. Can’t wait to make this for my daughter’s party. Thanks for the great idea! We made one just like it for our daughters rainbow birthday party. I mentioned you and thanked you for your idea on my blog. Love it! Thanks for the step by step guide! Found you thru Pinterest! My daughter will be having a balloon banner soon! I love this idea!! I can’t wait to try it for my sister-in-laws babyshower I’m throwing! I think this looks better than the original bunting idea I was going to do. Thank you so much for sharing and keep a look out on my blog to be recognized once I complete it! Thank you! 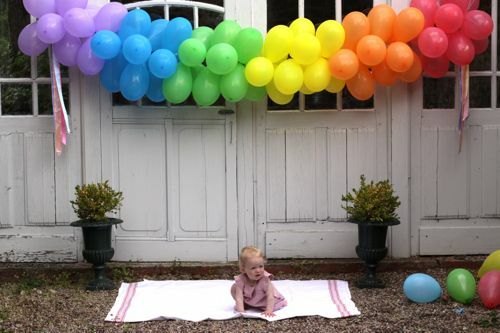 This is the cutest idea for a rainbow birthday party. My daughter had her 6th Birthday party and we made this balloon garland….it was AWESOME!!! 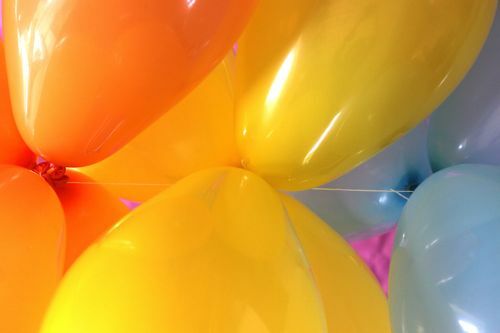 I bought the balloons at Wal Mart (the jumbo mixed pack was the cheapest I could find) We used the air compressor to fill the balloons and linked each group of 4 balloons together with a paper clip…then used twine to put them all in a line….it turned out picture perfect. Thank you for the wonderful idea!!! I made this last night for my sister’s surprise party. It looked amazing and your instructions were perfect. Thank you, Thank you, Thank you!!! Thanks for this idea!! I think I’ll use it for my twins’ first birthday this week!! We used to make these for sorority events in college. You can also use paperclips (three or four ballons per clip and then reform around fishing line). just curious how long it is…. It was a big hit! Thanks again! Just found your lovely rainbow banner on Pinterest! I also live in France (pinch) and will be using this idea for my daughter’s fourth birthday this weekend! Merci beaucoup. I’ve done this for years and always get a huge response when I make them. I’ve always done the rainbow theme with mine as well because I’m a sucker for Roy G Biv. I’ve always just strung them on all together and then made sure they were all together and it looks exactly the same as yours. But it only takes me about 5 minutes to string all the balloons on the needle. I like the idea of twine and a bigger needle. I’ve always used fishing line and while it works, sometimes we have a hard time attaching the fishing line to things. Thanks for sharing your instructions- I made one for my daughter’s birthday as directed and it turned out really pretty and fun! Much less time consuming that I thought it would be too, thanks! Thank you for sharing this! I definitely want to try this for my daughters birthday next month! Great tutorial! Skip all the pointed tools and just tie your balloon neck onto the line the first time. . .one knot and you are done. . .they will slide together easier on fish line. The banner will last a week if it is inside. . out of direct sunlight. Keep up the great ideas! Beautiful pictures too! Doing a rainbow birthday party for my 3 year old tomorrow and just made the balloon rainbow with my cousin for the party. It was really fun! There is a much easier way to make this. That would have taken forever. 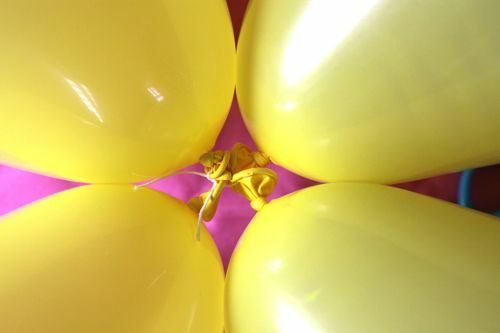 Try tying two balloons together then the second two the same. Twist the sets together to make a cluster of 4. after tying the string to 2 chairs across from each other simply twist the cluster of 4 to the string. The needle is not needed at all. I am in LOVE with your balloon banner! How cute!! I am doing a Birthday Party Round-up on my blog today and have included this in the list! Feel free to check it out! Wow, this is a great way to do this, but not the easiest. 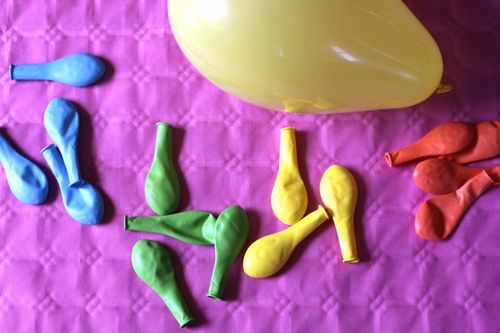 IF you can tie balloons easily, here’s the way professionals do this. 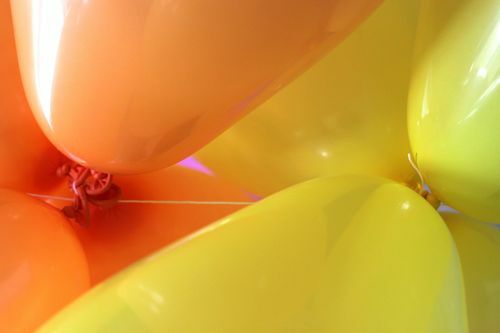 Balloons are tied together in twos. Cross two pairs together and twist a couple of times- there’s your cluster of four. Twist this a couple of times around a string or fish line – push gently up against the next cluster- keep adding and this will create your arch/ banner! ( Slide carefully along your string/fish line or it could cut your balloon. If you’re using helium do this the same day. Regular air filled balloons can be done days ahead and hung. 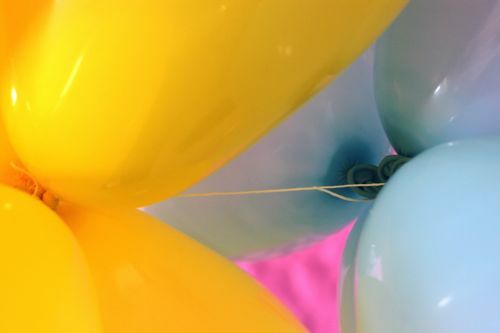 Want to make balloons on poles/PVC pipes? Tie four balloons to a rubber band- thread then tightly on the pole. Just saw Allison’s and haylee’s post! : ) the key here is being able to tie the balloons together and not your fingers, lol. How far in advance do you think I could do this? Can you tell me how long this banner was? Really would love to do it for my son party but need to know if I need to make it longer to fit the space I wanna put it in. Thanks.